Business energy specialist GDF SUEZ Energy UK has finalised an agreement to purchase all of the power generated at the proposed biomass-fired power plant project in Rotherham. The Brite Partnership secured planning permission in 2010 for a biomass development at the Firth Rixson Ickles Works at Templeborough where land and disused buildings where purchased in March 2011. 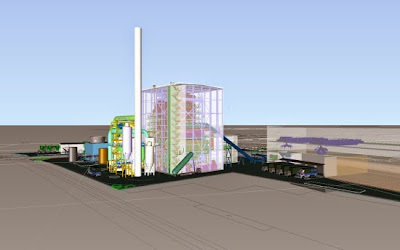 The plant will generate heat and power from carbon-neutral renewable wood pellet fuel. Last month it was announced that Copenhagen Infrastructure Partners (CI) had acquired 100% of the project for £150m and has now created Templeborough Biomass Power Plant Limited to take the development forward. The power purchase agreement (PPA) is one of two (the other at Snetterton in Norfolk) awarded to GDF SUEZ Energy UK, a dedicated business-to-business energy company in the UK that specialises in supplying energy to the industrial and commercial sector. Based in Leeds, it is a subsidiary of French energy giant, GDF Suez. Expected to be commissioned in March 2017, the 39.3MW Rotherham plant will burn waste wood to generate 315GWh of electricity each year – all of which will be purchased by GDF SUEZ Energy UK. Although prices have not been disclosed, the 15 year deals will see GDF SUEZ Energy UK buy the output at an index-linked rate, providing a market-reflective price for every kWh of electricity generated. To provide an assured return on investment, the PPAs also include a floor price, guaranteeing a minimum rate for the output. PPAs are essential to the viability of any new renewable energy plant. Funders of these major infrastructure projects need concrete assurances that the money they invest will be repaid through the sale of energy to a reliable, experienced and credit-worthy offtaker. GDF SUEZ Energy UK has built up a strong reputation as a leading player in the power purchasing arena, having secured agreements with several major renewable energy plants in recent years. Paul Roberts, head of local portfolio management at GDF SUEZ Energy UK, said: "These new agreements are the first PPAs we have secured for biomass plants, having previously focused on wind power and energy-from-waste technologies. It demonstrates the flexibility of our PPAs, which present an attractive and secure proposition for any type of renewable energy plant." Rúni Bro Róin, senior partner at CI, added: "We're pleased to have found the basis for cooperation with a strong and reputable partner like GDF SUEZ, which will be the sole purchaser of energy from both Snetterton and Templeborough." GDF SUEZ Energy UK will also purchase all ROC and LEC certificates received by the two plants, which will help the energy supplier to meet its own sustainable sourcing commitments under the government's Renewables Obligation.